All patients with B-CLL have involvement of the peripheral blood and bone marrow. A diagnosis of B-CLL can be made when there is a sustained lymphocyte count of >5 x 109/l for at least 3 months, if the morphology and immunophenotype are typical. When the immunophenotype is typical of B-CLL but the absolute lymphocyte is <5 x 109/l and in the absence of lymphadenopathy, organomegaly, or of disease-related cytopenias or disease-related symptoms, the diagnosis of monoclonal B-cell lymphocytosis of uncertain significance should be made. See Hallek M, Cheson BD, Catovsky D, Caligaris-Cappio F, Dighiero G, Döhner H, et al. iwCLL guidelines for diagnosis, indications for treatment, response assessment, and supportive management of CLL. Blood. 2018 June;131(25):2745-2760. There is usually an increase in small mature lymphocytes with clumped chromatin and scant cytoplasm. Pro-lymphocytes are usually <2% and increased numbers indicate a poorer prognosis. Variant CLL (CLL/PLL) has >10% prolymphocytes, whereas a finding of ≥55% prolymphocytes would favour a diagnosis of prolymphocytic leukaemia (B-cell PLL). Anaemia, spherocytes, and reticulocytosis suggest an autoimmune haemolytic anaemia. Bone marrow involvement may be nodular, interstitial, diffuse or a combination of these. A bone marrow aspirate and trephine is not required for the diagnosis of uncomplicated B-CLL but may be useful in certain situations: to determine the cause of cytopenias; where morphology or immunophenotyping are atypical; assessing response to therapy; assessing prognosis. Lymph node biopsy is not required for the diagnosis of uncomplicated B-CLL but may be useful where the diagnosis is uncertain or in patients with bulky lymphadenopathy to exclude transformation to high grade lymphoma. See WHO Classification of Tumours - Pathology and Genetics of Tumours of Haemopoietic and Lymphoid Tissues, fourth edition, 2008, pp 127 - 128. The panel of antibodies and scoring system used to differentiate B-CLL from other mature leukaemias is that recommended by the British Committee for Standards in Haematology. Table II. Scoring system for the diagnosis of chronic lymphocytic leukaemia (CLL). Scores in CLL are usually >3, in other B-cell malignancies the scores are usually <3. For a comparison of the laboratory findings in CLL with other low-grade to intermediate grade B-cell lymphomas/leukaemias, see ASH EPB 2004 p.229 Table 5, laboratory differential diagnosis. Cytogenetics and DNA analyses give prognostic information but are not routinely required. They may exclude a t(11;14) translocation in CD5 positive leukaemias where the diagnosis is uncertain. Patients with del(17p) respond poorly to fludarabine-containing regimens and may benefit from alternative approaches, e.g. monoclonal antibodies, high dose steroids, allogeneic transplantation, or novel agents. Patients who are known to have del(17p) are not eligible for publicly funded rituximab. Note: Peripheral blood is the preferred specimen type for cytogenetics - 20 mL in heparin. This allows FISH or chromosome analysis to be performed on more mature lymphoid cells. Bone marrow can be studied if necessary. For further reading, see Impact of cytogenetic and molecular prognostic markers on the clinical management of chronic lymphocytic leukemia by Hauswirth and Jager 2008. Patients with leukaemia cells that carry TP53 mutations, with or without del(17p), respond poorly to standard chemotherapy regimens as well. Ig heavy and light chain genes are rearranged. 50-60% of CLL patients have a somatic mutation of the immunoglobulin VH genes, and the remainder have unmutated Ig VH genes. This has strong prognostic significance. The outcome of patients with leukaemia cells with unmutated IGHV gene is inferior to that of patients with a mutated IGHV gene. Increased expression of the ZAP-70 gene may act as a surrogate marker for Ig mutational gene status. These techniques are difficult to perform and are still not widely available. For a full discussion of the biology of the CLL cell including cytogenetics and genetic analysis, see Dighiero, G. (2005). "CLL Biology and Prognosis." Hematology 2005(1): 278-284. See also Hallek M, Cheson BD, Catovsky D, Caligaris-Cappio F, Dighiero G, Döhner H, et al. iwCLL guidelines for diagnosis, indications for treatment, response assessment, and supportive management of CLL. Blood. 2018 June;131(25):2745-2760. 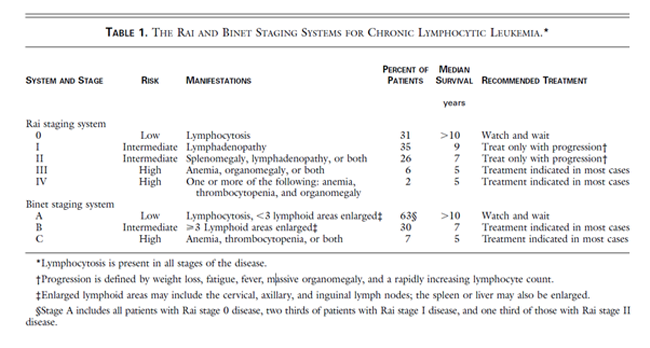 The Rai and Binet Staging systems describe 3 major sub-groups of patients with distinct clinical outcomes. Their advantage is that they are simple and based solely on physical examination and basic laboratory tests. See the ASH-SAP Rai and Binet Clinical Staging System. Dighiero, G. and J.-L. Binet (2000). "When and How to Treat Chronic Lymphocytic Leukemia." New England Journal of Medicine 343(24): 1799-1801. The French CLL Co-operative Group identified a subgroup of patients with smouldering B-CLL defined by stage A disease with Hb>13 g/l, lymphocytes <30 x 109/l, minimal or no lymphadenopathy, non-diffuse pattern of BM involvement and lymphocyte doubling time >12 months. Only 15% patients showed progression over 5 years and 80% were alive at 10 years. However, with increasing knowledge of the biology of the CLL cell, integration of this new material with older staging systems is providing more precise prognostic information. For example, the Binet staging system has been correlated with Ig gene mutational status and ZAP-70 expression (see ASH 2005). The above integrated staging systems provide an excellent guide to the prognosis of new patients presenting with CLL. New prognostic markers including ZAP-70, IGH mutation status, and CD38 have recently been reviewed by Moreno and Monserrat 2008 (Moreno, C. and E. Montserrat (2008). "New prognostic markers in chronic lymphocytic leukemia." Blood Reviews 22(4): 211-219). Rai or Binet stages help stratify patients according to disease risk. However, there are other biomarkers that can provide additional prognostic information. The most relevant parameters are IGHV mutational status, serum beta-2 microglobulin and the presence of del(17p) and/or TP53 mutations. These additional biomarkers have been incorporated into prognostic scores. One of these is the CLL international prognostic index (CLL-IPI), which consists of a weighted score that includes clinical stage, age, IGHV mutational status, serum beta-2 microglobulin, and the presences of del(17p) and/or TP53 mutations. For more detailed analysis, see International CLL; International CLL-IPI working group. An international prognostic index for patients with chronic lymphocytic leukaemia (CLL-IPI): a meta-analysis of individual patient data. Lancet Oncol. 2016 June;17(6):779-790.